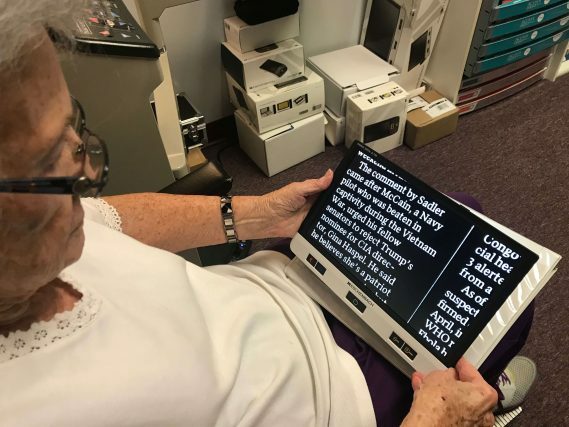 This patient suffers from dry macular degeneration and is unable to read, watch television or see her computer clearly. Dr. Rinkov fit her with a full diameter telescope for television with a Rx cap to place over her right eye for reading the computer. She was also fit with E scoop lenses with a yellow tint to reduce glare and to replace her former everyday glasses. These are custom lenses with a special curvature and thickness that enlarges objects slightly. In addition, she was fit with bioptics. These are like having binoculars on the top of her prescription lens so she can see signs, cars and people much clearer and sooner. This patient was struggling with macular degeneration. As a solution, Dr. Rinkov created lenses that use a prism to move the image the patient sees to a less degenerative part of the eye, have a tint to decrease glare and provide magnification of what is being seen. Because of her macular degeneration, Carol had a hard time reading her favorite books, the newspaper, and even her mail. Thanks to her new glasses, she can see much better and is already catching up on her reading list! Dr. Rinkov is able to provide extremely customized solutions for his patients. This patient only needed a customized lens for one eye. 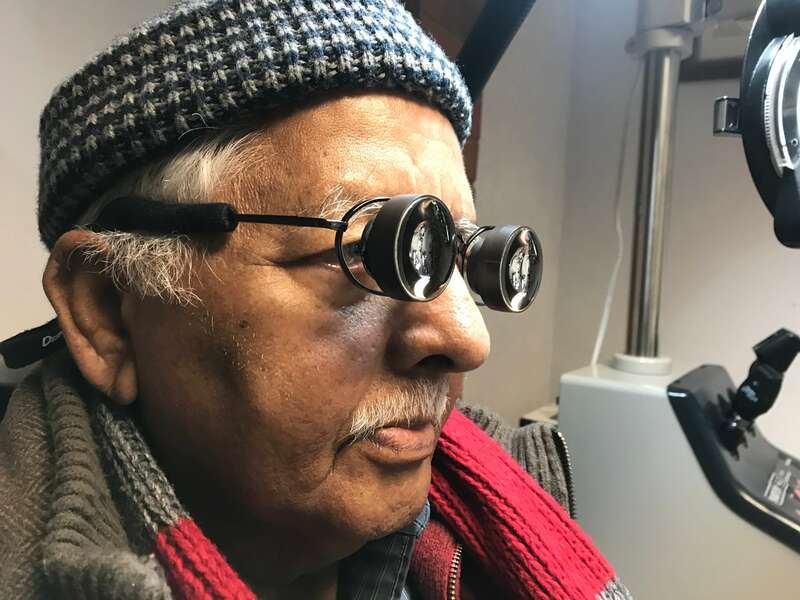 In an effort to reduce cost for his patient and improve her vision, he created only a lens for that eye. These glasses allow here to read and watch TV again. 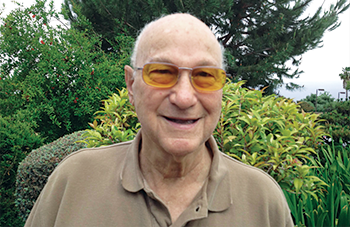 Before visiting Dr. Rinkov, the patient was diagnosed with macular degeneration in both eyes. The patient also had loss of vision in right eye and was unable to see well with his left eye at distance and near. To treat these conditions, Dr. Rinkov fit the patient with a full-diameter telescope for distance tasks with a removable magnification cap placed over the telescope for reading. This patient was struggling with Macular Degeneration. Dr. Rinkov created a pair of glasses with binoculars in the top of the lenses in order to make objects appear closer for his patient. Sometimes, there are simply no words to describe the feeling of being able to see better. Watch the video to see her amazing reaction while wearing her new telescopic glasses for the first time. The entire world of newspapers, magazines, and books is opened up once again, thanks to her new reading glasses! The patient suffers from macular degeneration in both eyes and was unable to see distance objects for years. Many doctors told the patient that nothing could be done for her condition. Watch this video to see what a difference Low Vision Doctors was able to make for this patient. The patient was unable to see for years due to wet macular degeneration and was told nothing could be done to help her condition. She wanted to see better at a distance and wanted to be able to read again. 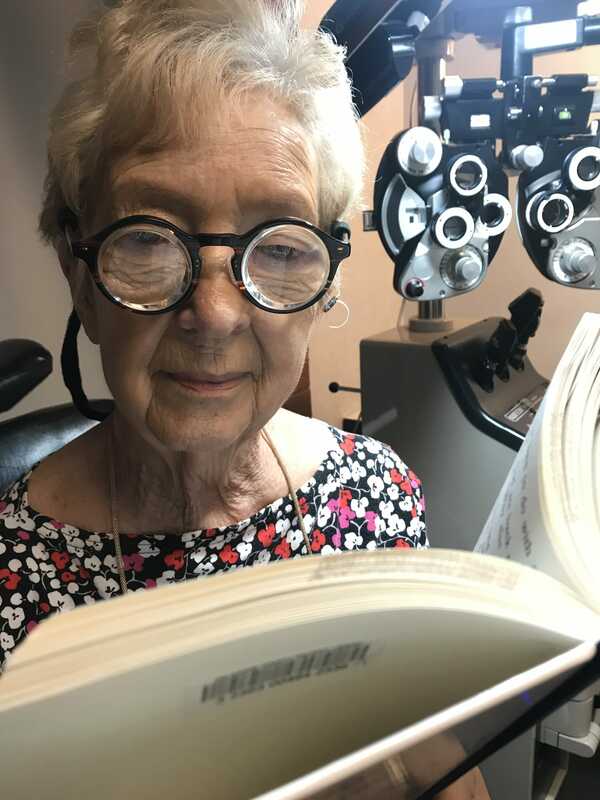 Dr. Rinkov prescribed her special reading glasses, bioptic lenses for distance tasks and special E scoop lenses to provide her better everyday vision with a yellow tint to reduce glare that was bothering her. These glasses magnify small print for this patient to read again. These glasses allow this patient to see distance and watch screens. At Low Vision Doctors of Ohio, we help patients of all ages see better. Eight-year-old Rochelle’s vision has vastly improved with her new glasses, which is critical for learning and development. Dr. Rinkov fitted this patient with reading glasses which magnify close objects and a pair of e-scoop glasses to help her see distance again. The tint of her e-scoop glasses helps to reduce glare. With the help of the digital reader, he can now read fine prints at the bottom of pages. He can now also see clear at a distance using bioptic glasses. She was not able to read her newspaper without special glasses. Now that she received her reader, she can now read her newspaper and bible. This patient able to see much easier at a far distance by using E-Scoop glasses. The lenses with tint prevent glare. This Low vision patient is having a hard time seeing at a distance and now she can see so much better with the help of bioptic glasses. She’s able to read again using the reader. 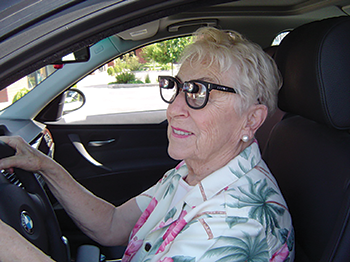 Mary’s able to do everything she wanted to do again after receiving her new E-scoop glasses. She can now read and write and also clearer distance vision. After receiving his new Bioptic glasses, he can now see cars from a distance, clear and sharp vision. The tint reduces glare. Dolores’ able to read books again by using the reader. After receiving her new telescope glasses, it has added a whole new perspective to her lifestyle. Low Vision Patient with Glaucoma in a Wheelchair After a Stroke Can See Again! This Low Vision patient in a wheelchair able to see at a distance again. He can watch television again and is now a happy camper. For the first time in years I can now read my books and newspaper with my digital reading device ! Thanks to Dr Rinkov for helping me when everyone else said that nothing could be done. Couldn’t read any print. Now can read large print books easily. This is the First time in years that she can read a book. She is so thrilled to be able to read once again as she was an avid reader before her eye problem. We helped her with Portable HD readers with variable magnifications and contrasts plus full diameter telescope for television viewing. I went to 3 different doctors and they all told me that NOTHING ELSE COULD BE DONE. I live by myself and could not see my television or read my mail, or bible. I was referred to Dr. Rinkov. Dr.Rinkov spent about an hour with me and now I can watch television and read again. He has given me back my enjoyment in life! Low Vision Patient has Retinitis Pigmentosa, Macular Degeneration, and Glaucoma. With the help of reader and e-scoop glasses, he can now read books and able to see clearly again. Dr. Rinkov fitted this patient with Full Diameter Telescope glasses which are designed for distance tasks and a reader to help him read and use a computer again. Dr. Rinkov fitted this patient with e-scoop glasses which are specially designed to bridge the gap between regular glasses and telescopes to help her see distance and play music again. 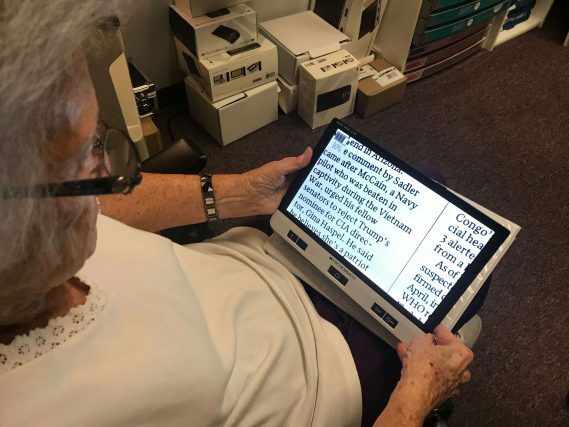 Husband of low vision patient discusses how his wife was able to read and watch news again with the help of low vision glasses and digital readers. 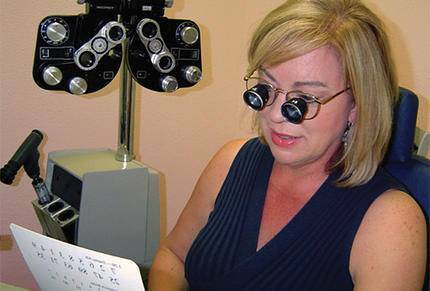 Low Vision patient is able to read and see at a distance again with the help of e-scoops and telescopic lenses. Patient that has Retinitis Pigmentosa able to read again and see people with the help of special Low Vision Readers.